Maximum pitch adjustment of +/- 40?, maximum roll adjustment of +/- 20? For the ultimate in projector mount flexibility, the Telehook ceiling mount ticks every box. 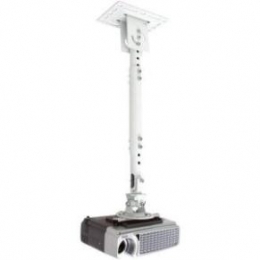 The state of the art telescopic pole securely supports the projector and can be extended by up to half a meter. Full rotation of 360 degree gives you unparalleled versatility when choosing room layout as well as multiple presentation position. Even angled ceilings aren't a problem. The pole can be adjusted horizontally by up to 45 degree to compensate. Easy installation and internal cable management complete this inventive design package.